Announcement: Australian Premier at FRINGE WORLD 2018! 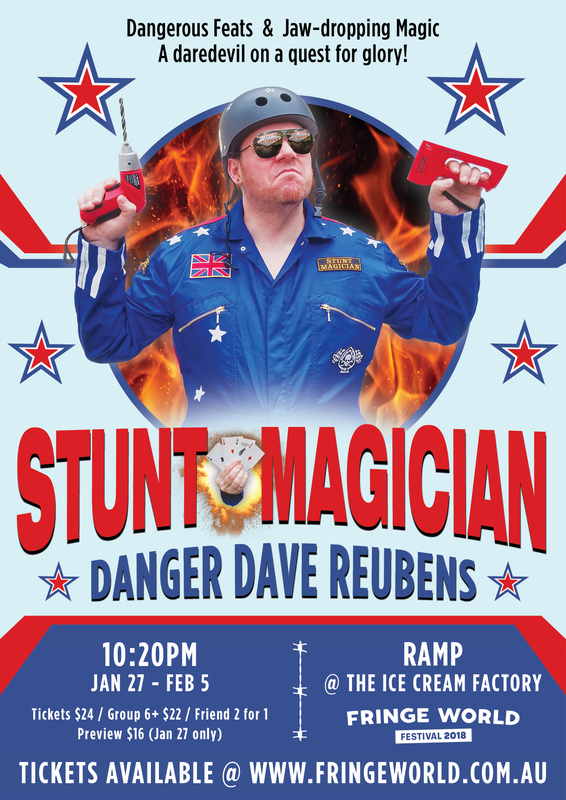 I’m totally stoked to announce the Australian premiere of my sell-out show hit Edinburgh Fringe show “Stunt Magician – Danger Dave Reubens”. The show is coming to FRINGE WORLD festival in Perth for 10 dates! + some sneaky street appearances! Use the link below to grab tickets. There are discounts for Fringe Friend members and previews too! Danger Dave Reubens takes you on a crash course in daredevil stunts, jaw-dropping magic and bizarre comedy. Your adrenaline fuelled host offers up edge-of-your-seat peril with an epic soundtrack. This is one for the thrill seekers and magic lovers. This is the Australian premiere of this sell-out show hit Edinburgh Fringe 2016 and 2017 show. Join the quest for glory!